This week makes me feel like I actually have a social life. Of course the direct implication of that is that I have not been doing much work at all, being either out with people or watching korean dramas. Met the Wynne on monday at parkway to chill and catch up because we hadn't seen each other in a while despite whatsapping each other nonsense things very often. So we took up space at starbucks for quite a bit before having lunch. It's weird actually; I don't actually remember what we talked about offhand or even what kind of things we were talking about (gossip?) but that was a rather enjoyable afternoon in the comfortable company of a close friend. Had to take the old macbook to orchard for reformatting which quite plainly did not work out. My bus only would go as far as Somerset so I had to walk to Orchard from there. But when I reached there I'd found that the service centre had vanished!! A quick google suggested that it might possibly be in Somerset, where I came from :< so I walked back there after browsing through F21 in search of a perfectly sized brown sling bag. (Urgh after typing that I went on qoo10 to find a sling bag I'm like a gnat) So I couldn't find the service centre in Somerset and further googling indicated that it was in fact still in orchard. I refused to walk back there so I made a call only for the technician to tell me that there was no more hardware support for this macbook. Boo. Met the Qi on Wednesday for lunch during which we naively joined the long queue for the fish head beehoon and dapaued it back to my house to eat. It was good but definitely not worth the queue in that hot, stuffy hawker centre. Well now I know. It's amazing how we can not talk for really long but there weren't any awkward silences between us and there're still things to talk and reminisce about. It's a warm feeling really, to know that perhaps this is how friendship works. You click and you're set for life. Had a simple dinner with the JC class on Thursday which was enjoyable save for the fact that 90% of them were in finance and were rattling off finance jargon etc etc etc and I being of the arts stream now had completely no idea what they were going on about. I suppose this is what people would feel like if they ever sat in on a dinner with the architecture people. We were supposed to eat crab but nobody felt like getting their hands dirty, including me. I guess this is what growing old is doing to us; rejecting yummy food in favour of dignity and convenience. We proceeded to island creamery after that though, all 10 of us squeezed into Hannah's 7 seater. Gosh that was an experience, and also literally the closest that all of us had ever been. If this was JC I'd have been disgusted but it was actually a rather fun experience. I say this in retrospect because at that time I was rather fearful for my life. Tuale was hilarious, and also the only person to have changed since JC times. Me: you don't have bus from here meh? should have what. TL: no la, last time still young, now I 长大 already, not scared anymore. This coming from someone whom I have not said more than 15 sentences to in the whole of JC. 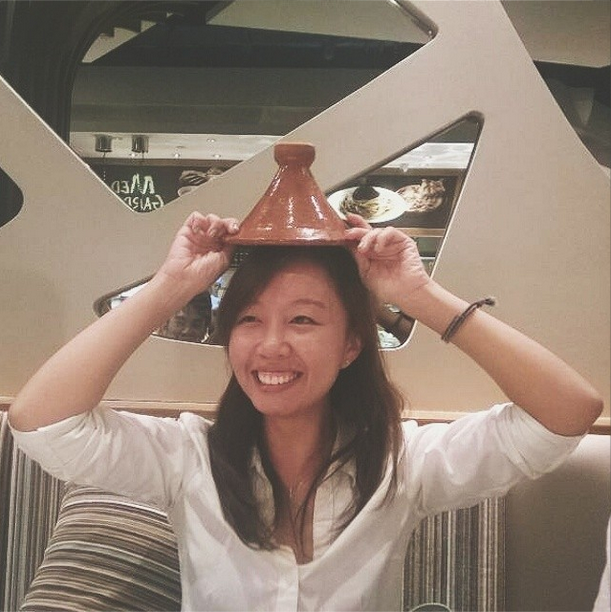 Had dinner with the archi people yesterday after going through the DID grad show. Couple of interesting projects and some really bewildering ones. Was pangsehed by Yilong who decided that Godzilla would take precedence over friends, and Chaggs, who in all fairness was excused because high probability of shitting her pants over dinner. 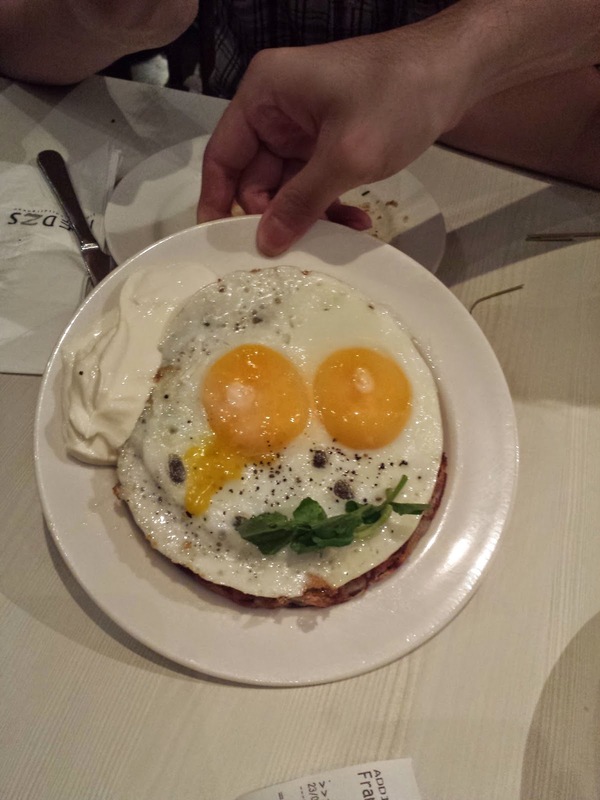 Our rosti with sunny side up. WEIRDEST COMBINATION EVER. Also zhoey decided to make him cry and kits decided to give him a moustache but if we're being honest here that's a terrible attempt at facial hair.